Located in the heart of Brookhaven, Georgia, Pour is a classic neighborhood wine bar known for its fine food, delicious drinks and festive atmosphere. Thanks to our friendly staff, hand-picked wine and carefully crafted cocktails, and artfully-prepared seasonal menus, Pour is a great spot for a weeknight meal or a large celebration with family and friends. We are thrilled to host you soon! Our dining room offers an ideal space for unwinding and enjoying our made-from-scratch modern American cuisine designed to pair with our wine list and distinctive cocktails. Explore over 50 different wines, and cozy up in our rustic atmosphere appointed with contemporary details. We offer a seasonal menu of shareable dishes and small plates for the perfect pairing. Join us for an expertly curated glass of wine, specialty craft cocktail and a delicious small plate or flatbread. Our relaxed but sophisticated environment is the perfect place to catch up with old friends or meet new ones. Join us starting Thursday, March 21st as we introduce our new Spring menu! We welcome the warm weather with seasonally-inspired dishes, cocktails, and wine selections. Interested in hosting an private party, event or meeting at Pour? 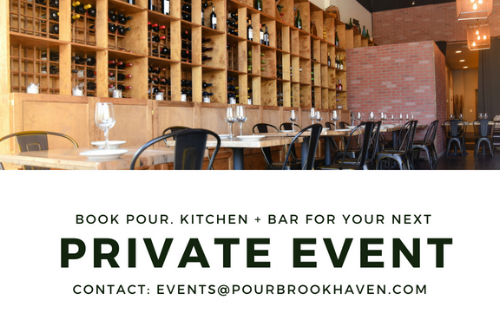 Contact us at events@pourbrookhaven.com for more info! Stop in alternating Saturday nights for Late Night Happy Hour featuring live music! Make your reservation here! Stay tuned or follow us on IG @pourbrookhaven for more updates including all new specials and events!